This Pew chart shows that there indeed has been a steep incline of 18-31 year olds living at home especially between 2008 and 2012. There is no indication in the chart footnotes that dormies are added to the number, nor is there any number anywhere that I can find that separately quantifies dormitory residents - so these stats are all we have to analyze. I can forgive those guys at Reason for blowing this analysis, but Warren Meyer is a much better statistician than he is showing here. Though it looks like there has been a drop since the 80s - kids not going to college staying with their parents looks like it has gone up about 10% since 2006. Might not be a blowout - but it is big enough to consider a trend. My guess is that campus housing counts as living with one's parents because it's only available when class is in session (thus requiring alternate arrangements during breaks, which are presumably provided by parents), whereas students who have off-campus apartments can stay in them year-round, if they wish to do so (and whether they stay there or not, they have to pay for them year-round). Also if you look at the charts above - both non college students and college students staying at home have gone up by the same percentage which means the story that it is just more kids going to college is false, otherwise the rise of college home dwellers would have gone up at a greater rate. Sadly it seems like this is another article covering for the current administration. If you look though, the rate of increase is the same for those not attending college as those attending. If that is the case - the increase, which is clearly shown over the last six or seven years has nothing to do with more kids going to college since the increase is up about 10 - 11% across the board. So the whole premise is wrong - the claim is no increase - but the increase is obvious and the other claim is the increase which doest exist is due to more kids going to college which is also false. That makes this a propaganda piece, and those who believe it are, as Rush Limbaugh would call them, useful idiots. 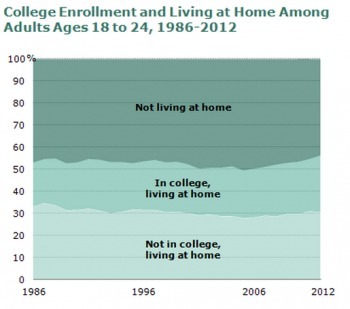 There seems to be a plain trend upward since 2006 for "In college, living at home". For such people, this seems to be a trend that is in fact a trend. Um, it appears to me that you're comparing apples and oranges. Your chart shows _young people who are in college_ (or not), but the "supposed" trend is young people _graduating from_ college and then living with their parents because they can't afford a place of their own. Can you show us a similar chart that only looks at _college graduates after graduation_? The number of millennials staying at home. A 26% increase! Elderly are staying with kids more as well. so the excuse that so many more kids are going to college and living in dorms getting counted as living with parents is dubious. Stats are from the "College Enrollment and Work Activity" of the Bureau of Labor Statistic.